A few weeks ago, Kathleen M. Rodgers, one of my favorite authors, wrote about how her dogs have been enjoying their summer and the pool. SHe quickly tells us about the inspiration she finds from her pets. Characters in her books are joined with furry characters as pets make a part of each story. She has the sweetest photo of the dogs drinking from the pool in Dogs of Summer. 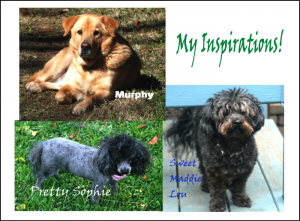 My beloved dogs, Murphy, Sophie and Maddie Lou, keep me company and definitely inspire characters. They inspire some serious DOG characters as in The Beggar’s Miracle and COUNTENANCE. Human and angelic characters are shaped by their relationship with the dogs. My attitude toward all characters is affected by the unconditional support and love from the dogs! The dogs make me be active. I have to break the writing trance to let them out or feed them or play with them. They say the computer chair is bad for one’s health. Well, those dogs make sure I don’t get glued to my chair! Their tender eyes are on me all the time to see if treat time has come around! My dogs and your dogs give us a wonderful connection for conversation! 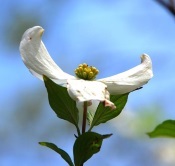 I know I love to tell you about mine and the inspiration they bring to my stories. I want you to know that I enjoy learning about yours! Whether you are a reader or an author, I want to learn how your dogs and other pets bring that touch of inspiration to each tale you spin. I’m so honored that you mentioned me in your wonderful essay on how dogs inspire your writing. Love it and the photos.